Everyone needs a WAIVER signed. Even adults. NO SHOES. No shoes may be worn on the padded mats or on the bouncers. Yes, even parents. SOCKS REQUIRED. Socks must be worn at all times. Forget yours? We have some for sale for a nominal charge. No sharp metal buttons, buckles, or latches on clothing. 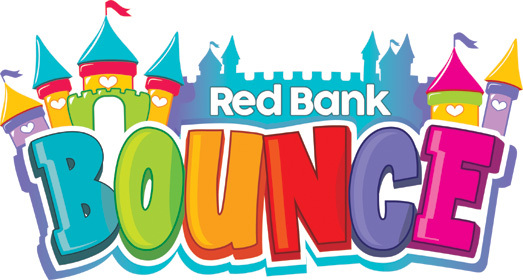 Red Bank Bounce is for children ages 11 and UNDER, and under 100 pounds. Older or bigger children and adults are NOT ALLOWED on the bouncers (see rule 6). This is for the safety of the younger children. Parents MUST ALWAYS monitor their own children. Parents are allowed to accompany children on to the bouncers to maintain comfort and safety as they see fit. Parents are NOT TO JUMP when they do this. We’re not kidding, it is a safety issue, we’ll have to ask you to leave, so please don’t make us do that. Absolutely no horseplay, shenanigans, rough housing, carousing, wrestling, brawling, fighting, fisticuffs, or frowning. NO FOOD or DRINKS on the bouncers or foam flooring. Especially suckers or gum. No animals allowed inside except genuine service animals accompanying a disabled person. Such service animals must stay in the parent area and are not allowed on equipment.